3 Beds 2 Baths 2,672 Sq. ft. Newer HVAC, hot water heater, freshly painted walls, and gleaming refinished floors. The Entrance Foyer features a built-in china cabinet and coat closet, plus access to the room which was the original 2-car Garage. The very spacious Living Room has a wood-burning fireplace, built-in bookshelves, and large windows which make this a bright & sunny room for relaxing and entertaining. The adjacent Dining Room offers great views of the rear yard and opens to the efficient Kitchen with Breakfast Bar. A flagstone Screen Porch offers great space for warm weather entertaining overlooking the rear yard. A brick wood-burning fireplace was added to the 4th BD, which has been used as a Family Room for many years. The 3rd BD and a full Hall BA complete the main floor. Upstairs are 2 more Hall BD and a Hall BA. A large dormer was added to one of these bedrooms, creating a spacious Master BD with 3 large closets. One of the BEST lots in a most sought-after neighborhood and is just a short stroll away from Wallingford train station, StrathHaven Middle School, & StrathHaven High School. 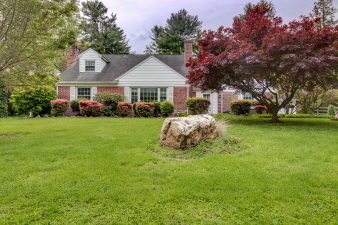 The expansive rear yard is very private, yet conveniently backs to the middle school playing fields. Ample covered parking is provided in the oversized, detached 2-car Garage which has a walk-up storage loft. The original 2-car garage for this home was partially converted into a large Bonus Room and could be finished to create add'l living space. Or, car buffs might convert it back and have indoor parking for 4 vehicles. Located in highly-regarded Wallingford Swarthmore school district, this home is convenient to the Blue Route, Airport, Center City, and shops & restaurants in the charming town of Media.